Since last June’s Brexit vote goods export volumes are up 6 per cent. But over that period import volumes are also up 6.3 per cent, suggesting no contribution to GDP growth from net goods trade [Image: Bloomberg News]. A disappointing performance for exports in June pushed the trade deficit higher than expected according to the latest batch of official data, frustrating hopes of a currency-driven rebalancing of the UK economy. Manufacturing also stagnated in the month and construction went backwards adding to the impression of Britain losing momentum as the clock ticks down to Brexit in 2019. 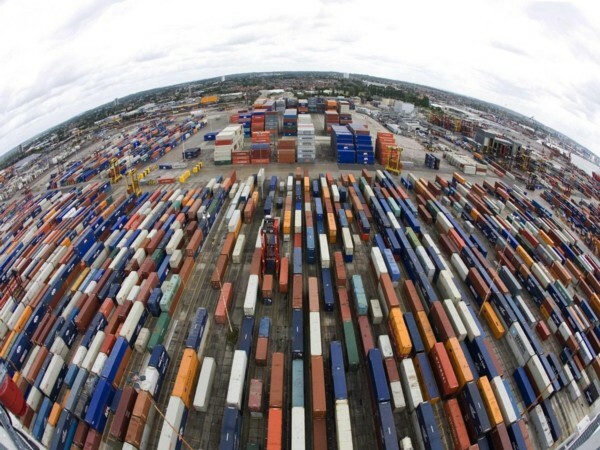 Goods export volumes fell 4.9 per cent in June, the biggest monthly fall since June 2016, while imports were up 1.5 per cent, said the Office for National Statistics (ONS). In reality our manufacturing jobs have been exported to the far east at the same time as Neo-Liberal theology allowed our manufacturing base to erode in favour of the financial sector. We are in the process of continual decline due to Neo-Liberal dogma and people must vote for change in massive numbers if we are to rid ourselves of that plague. We must also understand that the state has to intervene to fund a totally different sort of society, namely putting people first. The state has to reverse everything Neo-Liberal politicians have done over the last forty years, invest in public services, create new jobs instead of waiting for billionaires to benevolently use our talents in order to get even richer. In short, we have all the money we need to do whatever the country needs, but first we need a government willing to do it.